The story begins on M.S. Biko (an eel trawler). Captain, Joe, and Gimbo are lost due to a heavy mist. They help rescued Bwana, Kito and Lina who are out of fuel and adrift in the ocean. 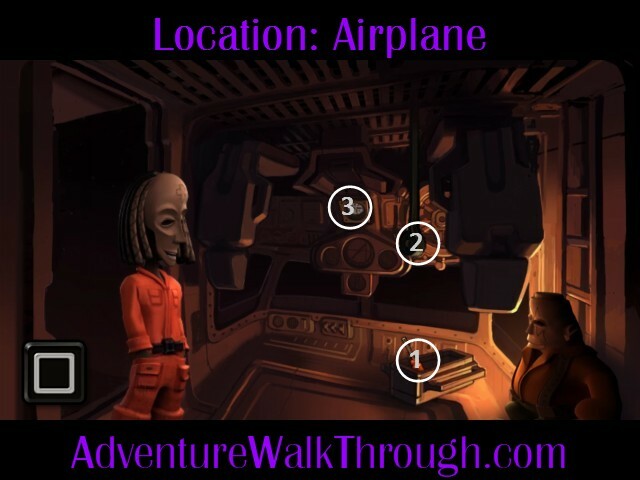 Your goal is to help the crew and Bwana find their bearing and get to Port Artue. 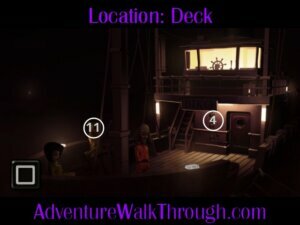 Use the following detail maps to locate items in each location: The deck, the cabinet, the bridge, and the airplane. 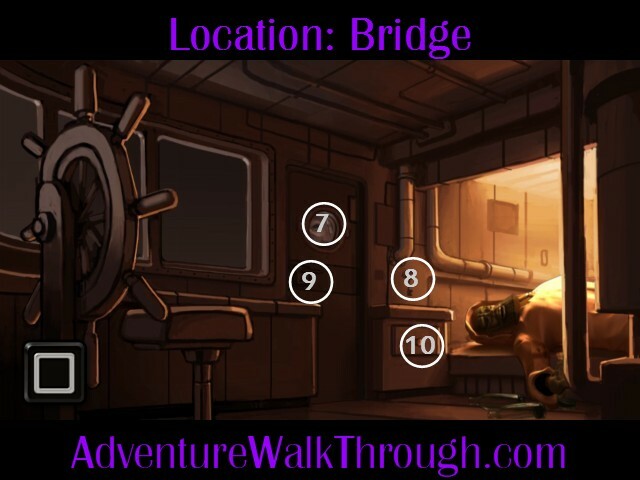 In order to find their location and bearing, Bwana needs a map and a compass. 1. Screwdriver: Climb down to the airplane. Grab the screwdriver in the toolbox on the floor. 2. Tape: Locate safety belt next to the pilot’s chair. Get the duct tape. 3. Compass: Use the screwdriver to remove and retrieve the compass on the panel board. 4. Loose Wire: Go back to the deck. Fix the loose wire on the wall outside the cabinet. 5. 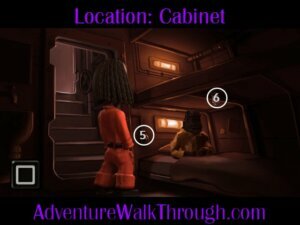 Light switch: Go into the cabinet. Turn on the light switch. 6. Spring: Take the loose spring hanging from the bunk bed. 7. Window: Exit the cabinet and go up to the bridge. The door is locked. Use the screwdriver to remove the window on the door. 8. Key: Use the spring to retrieve the door key. 9. 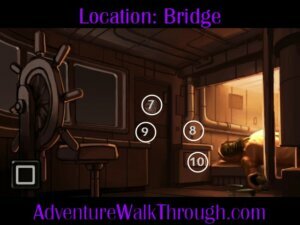 Door: Unlock the door and enter the bridge. 10. Navigation Book: Open the nightstand drawer. Grab the navigation book. 11. Joe: Return to the deck. First, gives Joe the compass, then the navigation book. Joe will operate the trawler and heads to Port Artue.